Pillow shams, or ‘sweetheart pillow covers’, were souvenirs from Army camps sent to parents, wives or sweethearts. This was an old tradition that continued during and after WW2. There are many designs, but in this new article I focus on those related to paratroops and gliders. Usually, these items were not dated, so to be able to confirm them as WW2 and not post-war, we need to look at the names of camps and units that are used. A clue can be the existence of the camps after the war. For example, Camp Mackall was created out of nothing during the war and decommissioned before the end of the war. 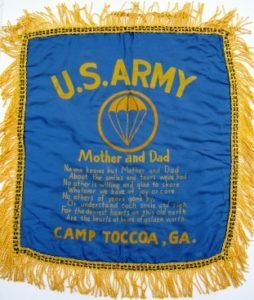 Camp Toccoa was open before the war, but paratroops were of course only trained there during the war, and it closed again at the end of the war.